Round Three was a relentless race of attrition. The women who survived to the finish were rewarded with an uphill bunch sprint, where the Zwift community racers proved their strength. Just 28 km long, today’s race covered three laps in New York City’s Central Park. No major climbs, but the constantly rolling terrain means racers need to stay focused. Each lap ends on top of Cat’s Paw Hill, a short, 300-meter climb with an average 6% grade. Racers approach it from a slight descent. This means they can be carrying incredible speed into the sharp, uphill sprint finish. Nearly all of the racers stayed together for the first several kilometers of the race. The first rider to make a move off the front was Ilaria Sanguineti (Valcar-Cyclance). 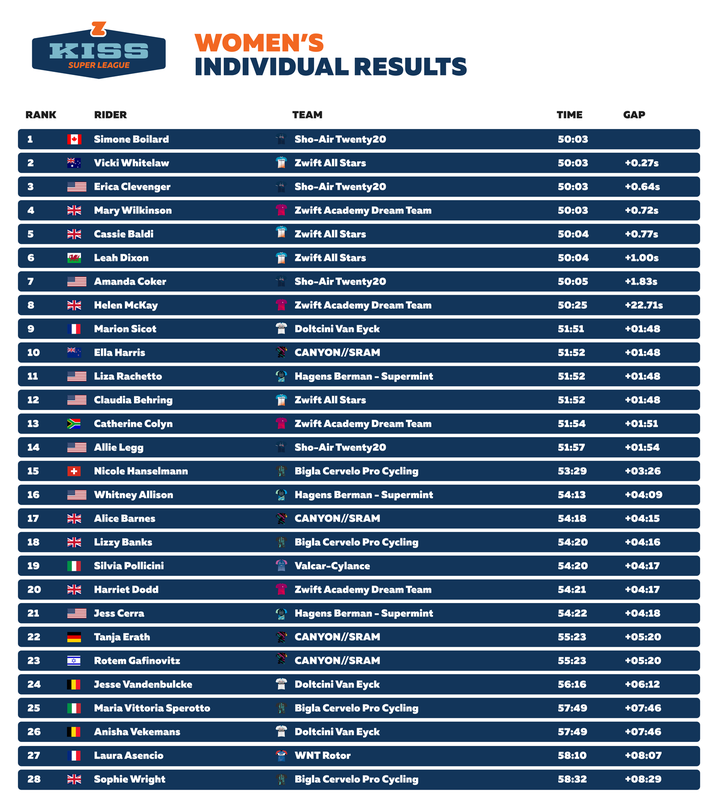 Laura Asencio (WNT Rotor) was on her tail. They didn’t get far, but the attack shook off four racers from the group and baited out PowerUps from several others struggling to stay in contact. At the end of the first lap, Louise Houbak (Zwift All Stars) surged to the front and led up the short climb at a punishing pace. Another handful of riders went off the back. Houbak tried again during the second lap, and again the group got smaller. No moves were getting away, but they were doing damage. 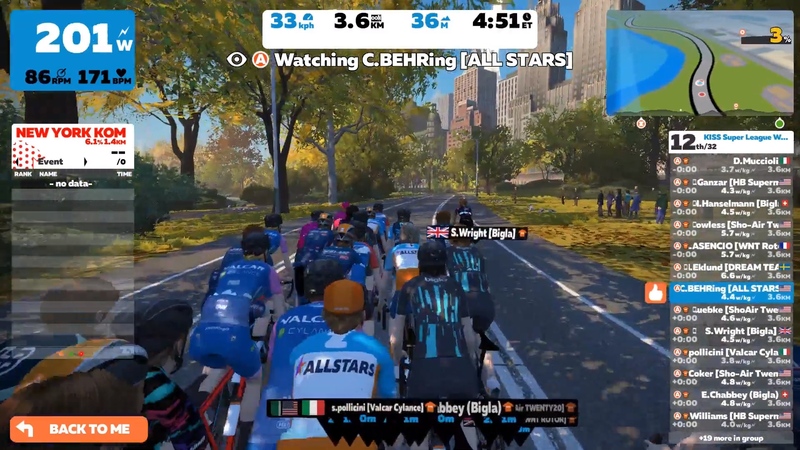 As the lead pack approached the final kilometers of the race, there were 13 racers left in front – including four riders each from the Zwift All Stars and Sho-Air Twenty20. Canyon//SRAM had two riders in the group. Sho-Air Twenty20 seemed to be keeping the pace high throughout the race. Their rider Amanda Coker often took to the front of the peloton, pushing big watts and making sure no dropped riders could get back. With 6 kilometers to go, Coker surged off the front and got away! At first, nobody chased her, as they waited for the pack to swallow her up like the others. But the Sho-Air Twenty20 rider sustained her gap of a few seconds and wasn’t slowing down. 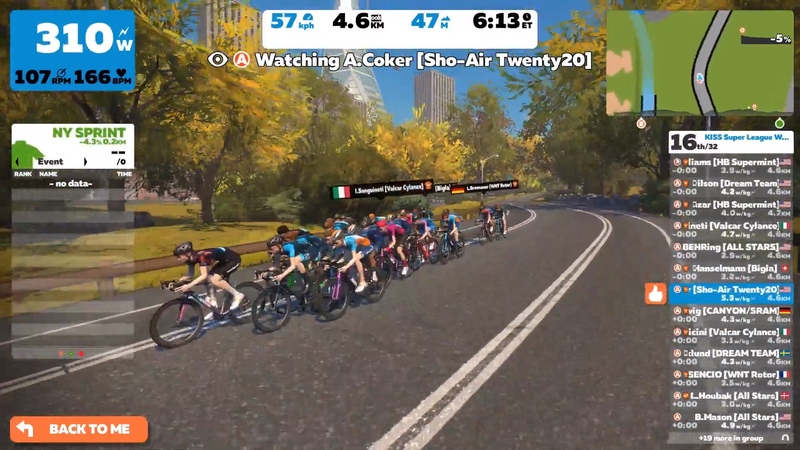 Finally, Britt Mason (Zwift All Stars) rocketed out of the group to bridge up to the breakaway, followed closely by Shayna Powless (Sho-Air Twenty20). The others surged in response. Soon, it was all back together. In a final attempt to shake things up, Jen Luebke (Sho-Air Twenty20) went for a late attack with an aero helmet PowerUp, 1 kilometer from the line. But she could not get a gap on the group behind. The pack picked up speed as the finish line neared. Nathalie Eklund (Zwift Academy Dream Team) opened her sprint early, just before the final short climb, with an aero PowerUp. But as soon as they hit the slope, Zwift All Stars teammates Houbak and Mason sprinted ahead with aero PowerUps of their own! Nobody could follow the pair as they shot away from the charging group behind. With her strong finishing kick, Mason finally came around Houbak to take first place. Eklund held on for third. 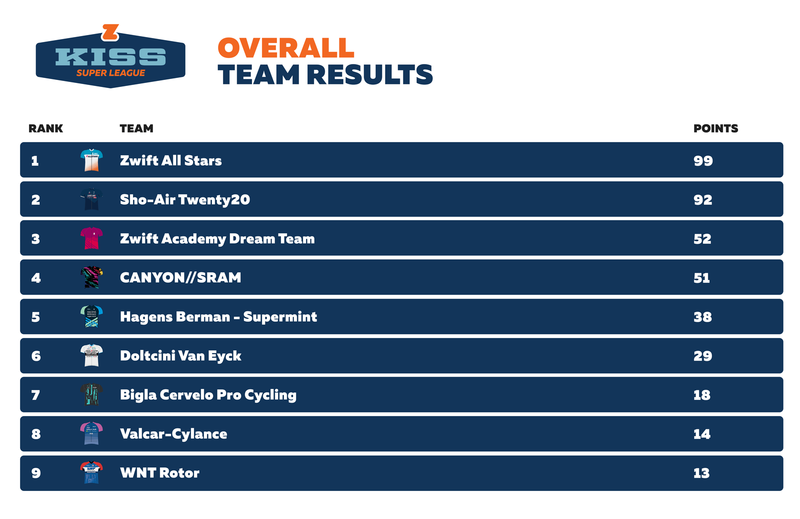 The Zwift All Stars now keep their lead in the overall team competition, with Sho-Air Twenty20 in second. “Keeping multiple riders in the lead group has certainly worked well for us so far!” said Mason. 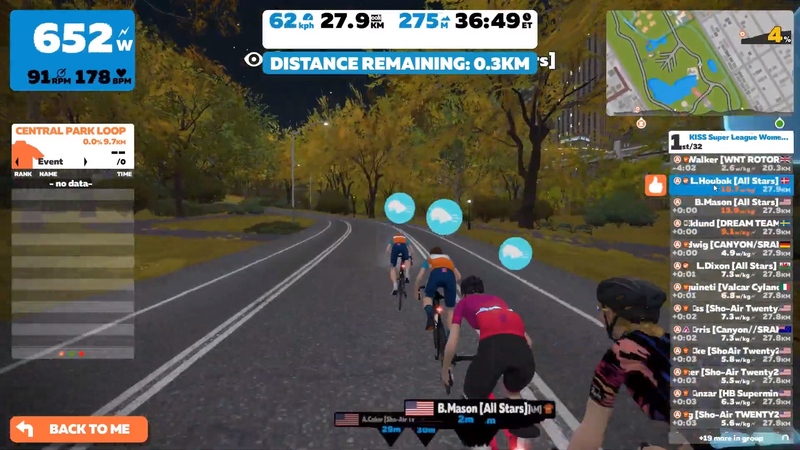 The Zwift All Stars expected this week’s race to end in a bunch sprint. As a strong sprinter, this would work in Mason’s favor. She said she did her best to conserve energy for the finish. When Coker went off the front late in the race, Mason got a little worried. This week’s intermediate sprint competition did not see explosive action, as the riders seemed to be more concerned with making it to the finish line. But a few of the fastest racers still targeted this prize. Next Wednesday, the women will ride the same Richmond, Virginia course where the UCI Road World Championships were held in 2015. Tune in live to see what happens!